WILL PULL 1" to 3" PLUG OF DIRT OUT OF THE GROUND TO LET AIR, FERTILIZER AND WATER TO PENETRATE. MAKES COMPACT GROUND LESS COMPACT. THE DEPTH OF THE PLUG CAN BE ADJUSTED. WILL NOT FIT IN THE TRUNK OF A CAR AND BEST TO HAVE SOMEONE AT THE HOUSE TO HELP LOAD AND UNLOAD. THE GROUND NEEDS TO HAVE BEEN WATERED ON A REGULAR BASIS PRIOR TO USING. IF THE GROUND IS HARD AND DRY IT WILL JUST WALK ACROSS THE TOP WITHOUT PENETRATION. IF THE GROUND IS TOO WET, IT WILL TEAR UP THE YARD. 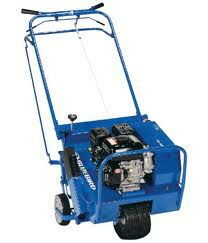 * Please call us for any questions on our aerator 18 inch lawn rentals in Dallas, Fort Worth, Arlington, Grand Prairie & DFW Metro Area.